Age Limit: Applicants should be below 35 years as on 14th November 2018. Age relaxation applicable as per Government Rules. There is no provision for PhD admission in IIST under Self Financing Category. Applicants with Master of Science in Engineering or equivalent from leading foreign Universities with minimum CGPA 9/10 or equivalent can be considered without GATE score. For candidates with M.E/M.Tech as their highest qualifying degree, selection to the PhD programme will be based on a written screening test followed by an interview. However, candidates with a valid fellowship such as CSIR/NET-JRF fellowships and CSIR-NET Lectureship post their ME/M Tech, will be directly called for the interview. They must have cleared a National level eligibility test, such as a valid UGC-CSIR-NET-JRF/Lectureship/ fellowship or NBHM/JEST/GATE and State Government Science and Technology Scheme, in the relevant disciplines. For candidates applying with their Master’s degree in Sciences as their qualifying degree and having a valid score card/certificate in any of the National level eligibility tests listed above, selection to the programme will be based on an interview to be conducted at IIST. Applicants must have Master’s Degree in the relevant area of Humanities/Management / Social Sciences with a minimum of 65% marks or 7.00 CGPA or equivalent in the Qualifying Master’s degree (60%marks or 6.50 CGPA for OBC, 55%marks or 6.00 CGPA for SC/ST/PD). They must have cleared a national level eligibility test, such as a valid UGC-NET-JRF fellowship/ State Govt. Science & Technology Scheme or similar fellowship schemes of Central/State Governments. 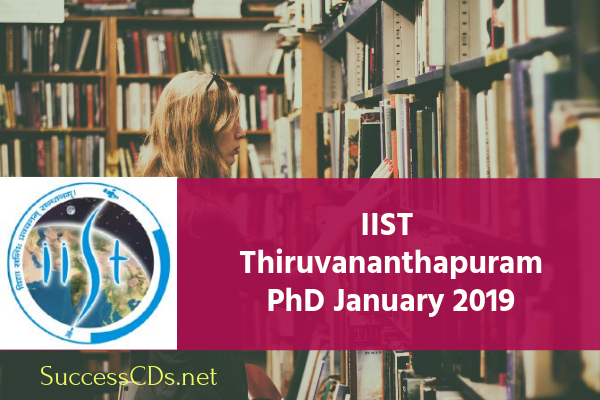 For candidates applying with their Master’s degree in Humanities/Management/Social Sciences as their qualifying degree and having a valid score card/certificate in any of the National level eligibility tests listed above, selection to the programme will be based on an interview to be conducted at IIST. Candidates who have been provided research fellowships by State Govt. Science and Technology Scheme through competitive written test can also apply. For Candidates having research fellowship by State Govt. without competitive written test will have to appear for written screening test. Applications shall be submitted online at the IIST website https://admission.iist.ac.in. Applications received online only will be considered. If the applicant is eligible and wishes to apply for more than one Research Area in the same Department, he/she need not pay any additional application fee. The application fee is non-refundable. Applicants who wish to apply to multiple departments, will have to pay the appropriate application fee (sum of the application fee for each department). Applicants who are employed in Government/Semi Government/PSUs/ Autonomous Bodies need to produce a “No Objection Certificate (NOC)” from the current employer at the time of Interview.